Cape marigold (Dimorphotheca spp. ) 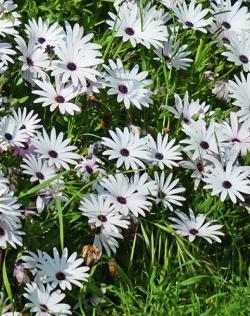 is also called the African daisy. It is from southern Africa, mostly in South Africa. It is a member of the large Asteraceae family, which includes asters, daisies, and sunflowers. The cape marigold looks like most daisies but comes in more colors. It can be orange, red-orange, gold, pale yellow, white, and tan. 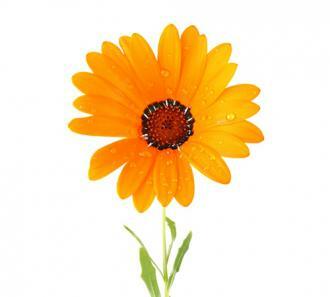 The cape marigold grows to about 12 to 18 inches tall. It has a green stem and green leaves. The cape marigold is used as low cover around shrubs or as the focal point in mass plantings. They also make nice borders. All parts of the plant are poisonous if ingested. The cape marigold can be highly invasive in hot dry regions so be careful where it is planted. Do not plant it next to meadows, wildlife preserves, or other places it could naturalize. Cape marigold is attractive to bees and butterflies. It is deer resistant. Cape marigolds are annuals, so have to be planted each season. They will reseed themselves if allowed to. They are used as winter color in zones 10-13, but are used as spring and summer color in colder zones. They bloom in the spring and will continue to bloom through the summer if deadheaded. They require full sun as the flowers will not open in the shade or on cloudy days. They also close at night. Cape marigolds require light, well drained soil. To achieve this, till the soil to a depth of 6 inches and work in 3 inches of compost. This will enhance the fertility of the soil as well as make it drain better. Cape marigolds are grown from seed. In warm regions, plant the seeds 1/8th inch deep in the fall. The plants will bloom in 50-60 days after planting. In cold regions, plant the seeds in the spring after danger of frost is past. Plants grow best when spaced 9-12 inches apart, but will tolerate a little crowding. Cape marigolds are drought resistant and only need to be watered once a week. Keep the soil moist but not soggy. Avoid getting the leaves or flowers wet when watering as this can cause fungal diseases. Deadhead flowers when blooming to keep the plants blooming through the summer and prevent them from reseeding themselves. Add a general purpose fertilizer when planting and then once a month after that. Aphids can be a problem with these plants. While they cannot be prevented, aphids can be treated with insecticidal soap and fairly easily eliminated. Natural enemies such as lady beetles also quickly bring aphid populations under control, so often no treatment is necessary. Cape marigolds are also vulnerable to fungal diseases if the leaves and flowers get wet. Crowding increases the likelihood they will have problems with fungal diseases as it restricts airflow around the plant. Cape marigolds come in a wide variety of colors and are easy to grow. Use them for color all season long in your garden.